68 pupils had the opportunity to go to the HoP today, after being successful in persuading us that they should go! 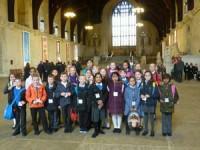 The day went extremely well, and the children were amazed to stand in the House of Commons and House of Lords. They learned about the fascinating history of how Parliament came to be, and the key points about democracy. We weren't allowed to take pictures, but the children will be sharing about their experience with the rest of the school. We look forward to the KFJS election on Friday!